Darjeeling is the northeast india provides the perfect ambiance of a hill resort with its mild climate and laid back charm valleys . Darjeeling (Darjeeling Gorkha Hill Council) in northeast India provides the perfect ambiance of a hill resort with its mild climate and laid back charm (Its verdant hills and valleys mare steeped in color, and are interspersed with vast stretches of lush green tea gardens. President over all these is the 8,856m Mt. Kanchenjunga looming over the northern horizon, giving a magical aura to the land that entices thousand to its environs and leaves all the senses intoxicated. Darjeeling is hemmed in by Sikkim in the north, Nepal in the west and Bhutan in the east. Darjeeling town, Kalimpong and Kurseong are the major urban centres. Heavy influenced by British India, Darjeeling still carries imprints reminiscent of its colonial past. The toy is on of the most striking examples of Darjeeling 's British Raj influence. By Flight : Darjeeling town is 90 km from Bagdogra, the nearest Indian airport, where scheduled flights operate from New Delhi, Calcutta and Guwahati. You can also fly from Kathmandu and take the one-hour flight to Bhadrapur (the nearest Nepalese airport to Darjeeling ). From Bhadrapur a 34 km drive will take you to Kakarbhitta (Nepal - India border, ) and then after covering 36 km you will reach Siliguri, the gateway city to the tourist destinations of Darjeeling, Sikkim and Bhutan. By Road : From Siliguri buses and taxis leave for Darjeeling ( 2 hours 30 minutes) which is at a distance of 77 km. Darjeeling is also connected by road with Sikkim (120 km) and Bhutan (about 200 km). By Rail : The nearest railheads are Siliguri and New Jalpaiguri (88 km) which are connected to Calcutta, New Delhi, Guwahati and other major Indian cities. 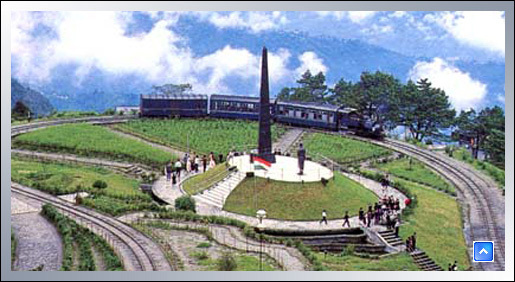 From Siliguri you can take the famous toy train (8 hours) to Darjeeling. Trekking, white water rafting, Kayaking, canoeing, mountain biking and rock climbing. There are modern hotels and restaurants in Darjeeling and Kalimpong, and comfortable lodges in Kurseong and Mirik. is provided by buses. Vehicles are also available on hire.Darjeeling is a hill top town overlooking hills and valleys below. Foreigners visiting Darjeeling must possess and Indian visa. No permits is required for those coming to Darjeeling by air through Bagdogra airport, and proposing to stay in Darjeeling town for not more than 15 days. However, they need to repot to the Foreigners Registration Office at Bagdogra airport on arrival and at the time of departure and get their passports endorsed. Those travelling by rail or road are required to obtain Restricted Area Permit before entering Darjeeling . To visit Kalimpong, this permit has to be endorsed at the Foreigners Registration Office in Darjeeling or, alternatively, at the office which issued it. No permits is required for trekking trip to Sandakphu and Phalut provided trekkers inform the Foreigners Registration Office in Darjeeling at least 24 hours in advance and also report on arrival at Sandakphu and Phalut checkposts.